UPDATE (Wed, Feb 27, 2019): Thanks to an extremely generous donation by one of our volunteers, we have reached our goal for Comet. We thank everyone for every dollar donated and especially for the large donation that took us over the top. 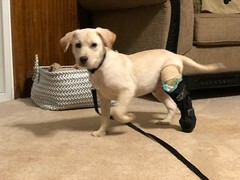 Comet is doing well and continues to mend at his foster home. We will let you know once he is all well and available for adoption. Thank you again from all of us at GRRA. 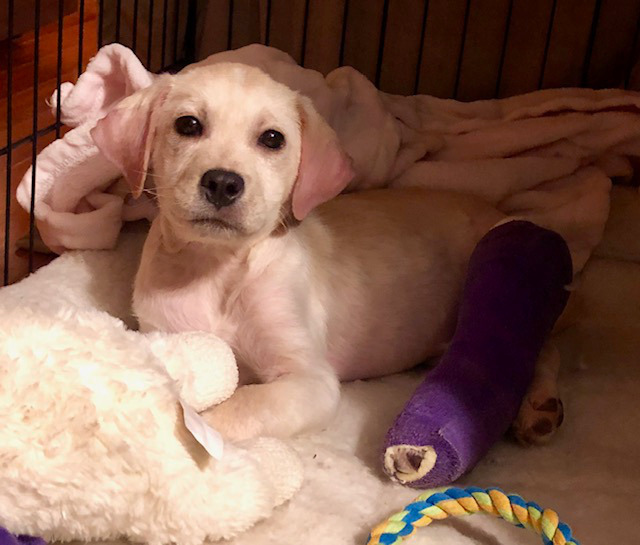 UPDATE (Sat, Feb 9, 2019): Comet had his cast removed along with the hardware. Unfortunately due to his growth spurt his growth plate has been compromised and he is having another surgery 2/7 involving the knee. In 9 months it is expected he may need an additional surgery. The alternative to the two surgeries is amputation and he has been through so much that we are not ready to consider that alternative. We are going to do what needs to be done to give little Comet the best possible outcome. The price tag for the surgery has now gone up to $5,500. We very much appreciate every dollar that has been donated thus far. It is our hope that there are a few people that we have not yet reached who can donate a few more dollars. 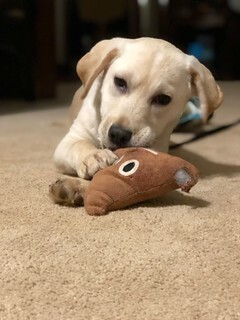 Hi, my name is Comet, and I’m a three-month-old golden mix puppy. I’ve had a tough life so far. You see, around Christmas time me and my three siblings were dumped somewhere and animal control picked us up and brought us to a shelter. Luckily, the nice folks at GRRA saw our potential and took us in to find us loving furever homes. I’m so happy my three siblings have been adopted, but I miss them dearly. For the last week or so, I’ve been in pain and limping on my back leg. The GRRA volunteers took me to the vet to get checked out. After my exam and X-rays, it turns out I have a left rear leg bone chip/break at the end of my femur and top of my fibia. On January 9th I had major surgery on my broken femur to wire the femur and ligament together. I’m happy to report, the surgery went well and I did great! The doctor said there is no damage to the growth plate, which is a good thing. As long as my recovery goes well the long term outlook is good that I’ll be as good as new! I will have crate rest for at least two weeks, something that I dread, but I know it’s good for me. But don’t worry, despite the big purple cast I am comfortable and cozy. It’s also an excuse to get more cuddles and kisses. I will have another vet appointment and X-ray in two weeks to check my leg, and at some point, a second surgery for wire removal. GRRA and I need your help in defraying the cost of my medical bills which are expected to exceed $3500. Any donation is welcomed and appreciated, big or small. GRRA and I thank you for your support!